The blue above is mostly blue. I found this poem with the image and notes at the CRS Archives -- hosted by the CRS Center for Leadership and Management in the Design and Construction Industry . . . of all places to find an Updike poem! The first four lines of this poem also appear in the central story of a short story triptych, "The Blessed Man of Boston, My Grandmother's Thimble, and Fanning Island," written in the spring of 1961, or so I have from pages 75-76 of William H. Pritchard's Updike biography, Updike: America's Man of Letters (2005). Wes Davis, however, informs us that the full poem was written in 1954. I'm curious where CRS obtained it, for the CRS Archives provide the late date 1969, and seem to imply that the image comes from Updike's own hand. 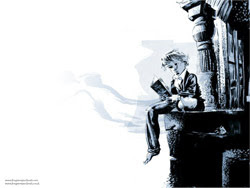 Does anybody know where the image originates? As we see from this example, David uses the ephod (something like divine dice) to ask God to reveal what the future holds, and God tells him what the future holds: Saul will come down to Keilah, whose citizens will surrender David. David therefore leaves Keilah, and the events foretold by God do not occur. The counterfactual that I understand is this: God foretells what will happen -- on the assumption that David should choose to remain in Keilah. Left unstated is what will happen if David should choose to leave Keilah, but David chooses to leave and escapes unharmed. I don't have a sophisticated argument here, but this passage seems to make more sense if one reads it in light of libertarian freedom than divine determinism. 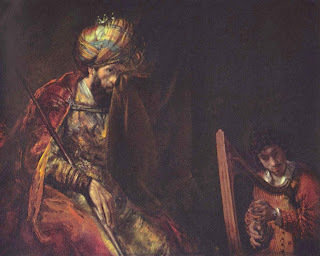 The passage seems to presuppose a true counterfactual in this world (rather than some other, possible world): if David remains, then Saul will capture him, but he leaves, so Saul does not capture him. Assuming that David has libertarian free will, then David's choice could make either outcome true (though God, being omniscient, knows what David will choose). By contrast, if David lacks libertarian free will, and God divinely determines every event, then God's statement of the foretold events would seem to me to be false, for God knows that he has determined David to choose to escape. If we assume divine determinism, God would seem to be making a false statement. I don't pretend that I've made a rigorous argument that libertarian free will is implicit in 1 Samuel 23:9-13, but it seems intuitively more likely to me. Other interesting passages to consider are Jeremiah 38:17-18, Matthew 17:27 and 26:24, and John 18:36. Moreover, how does Jesus know what Sodom would have done? That is, what grounds his knowledge? The Calvinist says that counterfactuals are grounded in God's knowledge of what he would have caused to occur in some other possible world. Hence, Jesus can know certainly what Sodom would have done in the possible world where he performed such signs in it. But if you are making an argument for libertarian free will -- specifically an argument which presupposes as necessary the principle of alternative possibility [PAP] -- then what grounds exist for this knowledge? Was Jesus just guessing? If PAP obtains, then in principle Jesus could not possibly know (that is, he could have no certainty) that Sodom would have repented. There just doesn't seem to be any way for him to know this, given that it didn't actually happen. Furthermore, even if some account for the grounds of his knowledge can be given, the problem remains as to how God can have knowledge grounded in anything but himself. How can he be genuinely omniscient if some of his knowledge is contingent upon his own creation? This would seem to destroy both his simplicity, and his status as the ontological grounds of knowledge itself (see John's use of the term logos). As Bnonn's comment shows, this is a complex issue. Even setting aside the problem of how Jesus would know things available only to an omniscient being (given Jesus's presumed kenosis), as Bnonn suggests, there remains the question as to how God could be "genuinely omniscient if some of his knowledge is contingent upon his own creation." Authentic omniscience: God's omniscience is grounded solely in divine determinism. Inauthentic omniscience: God's omniscience is grounded in more than divine determinism, e.g., also upon contingencies of creaturely freedom. By "divine determinism" is meant that God causes to occur or could cause to occur. If I understand Bnonn's point, then God's omniscience would be inauthentic if it were partly dependent upon the free acts of created beings. Why? Well, perhaps Bnonn means because God would then not know what would have happened if a created being had acted differently. If that is the case, then would God's omniscience exclude knowledge about possible worlds that entail creaturely freedom? Would this mean -- to 'misquote' Robert Browning -- that God's "reach must exceed his grasp"? God's omnipotence, which includes his power to actualize possible worlds in which creaturely freedom is actualized, exceeds his grasp to know what would result in such possible worlds? If so, then "authentic omniscience" would seem to exclude knowledge of some possible worlds. Largely the product of the creative genius of the Spanish Jesuit of the Counter-Reformation Luis Molina (1535-1600), the doctrine of middle knowledge proposes to furnish an analysis of divine knowledge in terms of three logical moments. 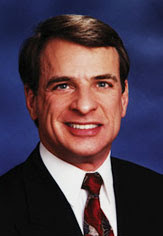 Although whatever God knows, He has known from eternity, so that there is no temporal succession in God's knowledge, nonetheless there does exist a sort of logical succession in God's knowledge in that His knowledge of certain propositions is conditionally or explanatorily prior to His knowledge of certain other propositions. That is to say, God's knowledge of a particular set of propositions depends asymmetrically on His knowledge of a certain other set of propositions and is in this sense posterior to it. In the first, unconditioned moment God knows all possibilia, not only all individual essences, but also all possible worlds. Molina calls such knowledge "natural knowledge" because the content of such knowledge is essential to God and in no way depends on the free decisions of His will. By means of His natural knowledge, then, God has knowledge of every contingent state of affairs which could possibly obtain and of what the exemplification of the individual essence of any free creature could freely choose to do in any such state of affairs that should be actual. then even God in His omnipotence cannot bring it about that S would refrain from a if he were placed in C. On the other hand, middle knowledge is unlike natural knowledge in that the content of His middle knowledge is not essential to God. True counterfactuals of freedom are contingently true; S could freely decide to refrain from a in C, so that different counterfactuals could be true and be known by God than those that are. Hence, although it is essential to God that He have middle knowledge, it is not essential to Him to have middle knowledge of those particular propositions which He does in fact know. Intervening between the second and third moments of divine knowledge stands God's free decree to actualize a world known by Him to be realizable on the basis of His middle knowledge. By His natural knowledge, God knows what is the entire range of logically possible worlds; by His middle knowledge He knows, in effect, what is the proper subset of those worlds which it is feasible for Him to actualize. By a free decision, God decrees to actualize one of those worlds known to Him through His middle knowledge. According to Molina, this decision is the result of a complete and unlimited deliberation by means of which God considers and weighs every possible circumstance and its ramifications and decides to settle on the particular world He desires. Hence, logically prior, if not chronologically prior, to God's creation of the world is the divine deliberation concerning which world to actualize. Given God's free decision to actualize a world, in the third and final moment God possesses knowledge of all remaining propositions that are in fact true in the actual world. Such knowledge is denominated "free knowledge" by Molina because it is logically posterior to the decision of the divine will to actualize a world. The content of such knowledge is clearly not essential to God, since He could have decreed to actualize a different world. Had He done so, the content of His free knowledge would be different. I freely admit that I don't understand all of this, for I haven't read enough and perhaps also lack sufficient metaphysical insight, but this series of posts is, after all, merely an investigation. But I am out of time for today. I spent this morning explaining to my NYC cyber-friend Malcolm Pollack a question that I had earlier posed to him, and since I'm out of time as a consequence of my explanation, I'll post that exchange here in lieu of some other blog entry that I might have worked up. This will sound odd, but do you know if the roof of the portico jutting out at ground level from the west side of the WTC's North Tower was made of glass? I've read of the jumpers' bodies striking the glass above the portico, and I wondered if this west side is meant. I infer that most jumpers were landing on the north side of the North Tower, for the plane struck on that side, and on the west side of the South Tower for a similar reason. I hope that I have the directions correct, but you can correct me. However, I suspect that jumpers were leaping from all sides. P.S. I'm currently listening to Dylan's "Forever Young," which I used to enjoy back in my now innocent youth of 1976 . . . Though I used to spend a lot of time down there, I don't really remember the portico. I think conditions were generally intolerable all throughout the floors above the impact sites, and that people were jumping all round, but I really don't know for sure. I have to say that even seven years later the memory of that awful day haunts us here in New York. If I seem unduly obsessed, in my bloggery, with the threat that Islam poses to the west, that is one of the main reasons why. I think being here and watching those towers burn and fall (especially knowing that my daughter was in school two blocks away, and not being able to reach her until late that evening), and then living in a stunned and broken city, under an enormous pall of shock and grief (not to mention the literal, acrid pall that hung over us for months as the ghastly Pile smoldered and smoked) made the event very different for us than for the rest of the world. Are you preparing a post of some sort? I recall being shocked at the image of an airliner entering a skyscraper when I saw the news on television. All night, that image continued to play, rewind, play, rewind. I told my wife that I wondered if we had done the right thing in having children, bringing them into such a world where such evil could be planned and carried out. But the full enormity hit me later, as I began to read accounts. I didn't watch much television, but in my office, I found details on the internet and learned more of what had happened. I've never been to New York City, and to be embarrassingly frank, I didn't even know about the two towers until they were struck. I didn't think about the NYC skyline in its details -- it was just a bunch of tall buildings -- and I wasn't especially interested in the City. The northeast coast generally was a cipher to me, far from where I grew up and even farther from where I went with my life -- from the Arkansas Ozarks to Waco, Texas, to the SF Bay Area, to Germany, to Australia, to Israel, to South Korea. 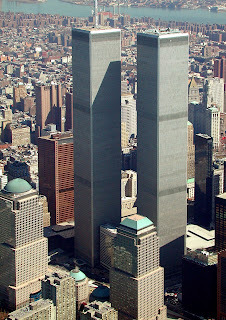 When I initially understood that the news was real and not some war movie on television -- and that must have taken me five minutes -- I found myself asking, "World Trade Center? Where is that? Chicago? New York?" I actually didn't know. But over the days and weeks that followed, I grew far better acquainted with New York City and the Twin Towers and grew to love the City and mourn the loss. It was the reports of people jumping, and the stories told by survivors that really got to me and began to prick my conscience and ignite my anger. I realiized that something had to be done. That was a very odd time, for only one Korean expressed sorrow to me over the 9/11 attacks. Everyone else whom I knew was silent . . . or took part in anti-American protests and blamed the US. I already knew about the dangers of Islamism -- though I didn't call it that at the time. I probably called it Islamic radicalism . . . or Islamic fundamentalism. Koreans seemed to know nothing about this religious radicalism and tended to see American foreign policy as the motivating factor in what the terrorist did. When I was asked to give a presentation at Hanshin University, where I worked, I decided to talk about 9/11 and explain some of the religious motivations. Since I had been reading about Islam for twenty years already (though not steadily), I knew what to look for and could use the internet and some of my books for sources. In my presentation, I explained about jihad as the motive behind the 9/11 terrorist attacks and noted that while such an attack probably couldn't legitimately be justified according to the rules of jihad, only the context of jihad theory could make sense of the attacks. I therefore spent some time detailing some of the Islamic justifications provided by the terrorists for the attacks in order to demonstrate that jihad motives were at work, namely, that while the terrorists didn't like American foreign policy, their more basic aim was subjugation of the infidels. A lot of Koreans simply failed to grasp this and refused to believe my report. I wrote the presentation down and published in a Hanshin journal. It didn't get much attention, but I have it on my blog roll among my online articles, and it occasionally gets clicked on . . . and possibly even read. As for my question about the portico roof, that's not for a blog entry (though is anything truly not for a blog entry?). I have a different project in mind for that, and I'm trying to understand more about the Towers. I need to understand concretely what the Towers were like and what took place. Partly, this has to do with my dismay at the conspiracy theories floating about the internet -- the US government setting explosives to bring down the two Towers in order to justify a conservative crackdown on American society. For that reason, I need to know more, but I have other reasons. Anyway, that's sort of why I asked about that portico . . . and I asked you because you often know obscure things, such as that Milton quote about "a good Booke" that stands above the portal to a large reading room in the New York Public Library. Thanks for the reply. I know that September 11th, 2001 must have been a profoundly harrowing day for you and your family. P.S. I love New York. That was my morning this morning . . . and I guess that Malcolm was right about me "preparing a post of some sort." By the way, does anyone know about the North Tower's portico that jutted out toward West Street? Was the roof made of glass? "are like Elizabethan miniatures: short, very finely crafted, exhibiting superb taste." "And I would also think hard about the present academic environment, in which state systems are being cut at a rate that exceeds the speed with which our retirement funds have shrunk. While at the same time, you have the rise of "assessment" and other noxious, related discourses. It occurs to me that the present situation is enough to make one yearn for the days of the culture wars. At least then, what we taught seemed to matter." Actually, now that I think about it . . . that's not especially comforting (other than as a misplaced shadenfreude on my part). But it does help by describing the context to my stalled career. Did I say 'stalled'? I meant retrograde. I'm actually moving backward, like one of those 'erring' planets on a Ptolemaic epicycle. For that matter, I'm also a bit eccentric. One should ever strive for accuracy of expression. I have the image above from Wikipedia, which confidently informs me that "Augustine of Hippo wrote that original sin is transmitted by concupiscence and enfeebles freedom of the will without destroying it." The anonymous contributer then cites an article on "Free Will" in The Oxford Dictionary of the Christian Church (Oxford University Press, 1997), edited by F. L. Cross and E. A. Livingstone. The statement that Augustine 'affirmed' free will surprises me, for I thought that he had denied it. Unfortunately, I cannot check the article to see what the anonymous Wikipedia individual was referring to, for I do not have the book that contains it. 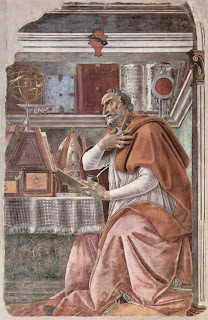 Well, that's my opening gambit, and it ain't much of one, but I liked the image of Augustine -- his eyes lifted up -- deeply engaged in moral and theological reasoning, for it's indicative of the deep waters into which I've gotten myself (my eyes also lifted up as I sink beneath the waves). [O]n what basis do you say that a "should" entails a "could"? All men should be perfect. Are you arguing that all men could be perfect? An imperative in no way leads one to infer an indicative. I've been hesitating to reply to this because I felt that I needed better grounding in the philosophical thinking on this issue. I don't want to go about reinventing the wheel. The wheel has already been invented, improved, possibly even 'perfected', so my own wheel is likely to be a crude one, vastly inferior. But I'll make some suggestions and ask some questions. I borrow this verse, both in English and Greek, from the Blue Letter Bible, as one might have expected. I admit that I've always been somewhat puzzled by this imperative, for it seems to be exhorting people to be something beyond their power. Possibly, one should understand the imperative to mean, "Try to be perfect, and you will learn that this is impossible, for the law is intended to teach you that you will fail" -- if one were to apply a Pauline hermeneutic here (cf. Romans 5:13-17 and Galatians 3:19-25, among other places). But maybe the point goes a bit further, namely, that perfection is possible, ultimately, if one accepts the grace offered and the glorification promised (again applying a Pauline hermeneutic, cf. 1 Corinthians 15:42-54). Perhaps one needs help to be perfect, but if one should be perfect, then one ought to accept that help. Say a man embezzles a million dollars, and is subsequently caught. At trial, because of mitigating circumstances, the judge agrees to defer jailtime if the man simply pays back the money. Unfortunately, most of it has already been squandered. Surely we'd agree that the man ought to pay back the money (in fact, even if he were not so ordered, he still ought to pay it back) -- yet certainly he cannot pay it back. The imperative does not imply an indicative. I think that the issue would be more complex than this. Of course, the man should not have embezzled the money in the first place, and presumably, he had a choice about that. Since he is guilty of a crime, he must make some sort of restitution or be punished (or both). One way would be for him to repay the money, and he should do this if he can. If he lacks the funds now, he could be required to pay back in installments. There is some possibility of repaying, even if the man currently lacks the money. By contrast, we would never say of a murderer that he should bring the dead man back to life, for that is not only currently impossible but also utterly beyond all human possibility. Returning to the embezzlement case, if for some reason -- let us assume -- we know that the man would not, ever, be able to repay, then the legal system could provide for punishment instead. The reasoning would be: "Since the man is guilty, then he should repay the funds if he can, but since he cannot repay the funds, then he should be punished with prison time." A legal system would be foolish to insist that the man should repay if he cannot. It would, rather, insist that the man serve time in prison. How would an imperative make sense if the act demanded were impossible? I can understand that an imperative might be given to teach a lesson, e.g., "Okay, be perfect by your own efforts if you think that you can be (but you'll find that you cannot)." But would that be a genuine imperative? Or rather a means of teaching a lesson? In the embezzlement example above, however, the moral assumption is that the man had a choice between embezzling or not embezzling. If he were forced at gunpoint to embezzle, we would likely not hold him responsible. Or, to put things another way, we would not hold the man's computer responsible for the embezzlement, for the computer had no choice, being merely an instrument of the man's will. Would we say that the computer should not have carried out the man's will? Wouldn't that be demanding of a computer that it ought to act in a way that it cannot act? Would such a demand make any sense? I'm not sure if I've adequately responded to this part of Bnonn's objections to my view that an "ought" implies a "could." Probably, I've merely chiseled a rough-hewn wheel from philosophical stone. 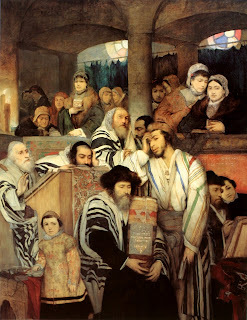 But man, who has had bestowed on him a voluntary and self-impelling intellect, and who for the most part puts forth his energies in accordance with deliberate purpose, very properly receives blame for the offences which he designedly commits, and praise for the good actions which he intentionally performs. Giovanni Reale provides an interesting discussion on the passage in which this occurs, so interested readers might take a look at what he says. I don't know if John R. Catan personally translated the passages into English or if he borrowed an existing translation. An endnote (page 485, n. 1) refers to important translations in various languages and offers as an English version the one in the "Loeb Classical Library" by F. H. Colson and G. H. Whitaker (and some kind reader could check). Ho de anthrwpos ethelourgou kai autokeleustou gnwmes lachwn kai prosairetikais chrwmenos ta polla tais energeiais eikotws phogon men eschen eph hois ek pronoias adikei epainon de eph hois hekwn katorthoi. With the benefit of this Greek original, I was able to locate two websites with the entire Greek passage online, in case anyone should be interested in taking a look (Quod deus sit immutabilis X, 47: here and here). Readers will recall that I was interested in what Yonge translated as "a voluntary and self-impelling intellect" and what Catan provided as "a spontaneous and self-determined will," for both translations make Philo sound as though he is talking about what contemporary philosophers call "libertarian free will." The Greek that I was interested in is "ἐθελουργοῦ καὶ αὐτοκελεύστου γνώμης" ("ethelourgou kai autokeleustou gnwmes"). For γνώμης (gnwmes), the Liddle-Scott dictionary gives "organ by which one perceives or knows, intelligence," which is closer to Yonge's "intellect," and "will, disposition, inclination," which is the same as offered by Catan. In either case, it would seem that Philo is speaking of the so-called "rational will." The important thing for Philo is that this "intellect" or "will" is free of the bonds of necessity, which is what he means by "ἐθελουργοῦ καὶ αὐτοκελεύστου" ("ethelourgou kai autokeleustou"). For ἐθελουργοῦ (ethelourgou), Liddle-Scott gives "willing to work, indefatigable," which fits better Yonge's "voluntary" than Catan's "spontaneous." For αὐτοκελεύστου (autokeleustou), Liddle-Scott gives "self-bidden, i. e. unbidden," which fits both Yonge's "self-impelling" and Catan's "self-determined." Thus, one might also offer for "ἐθελουργοῦ καὶ αὐτοκελεύστου γνώμης" ("ethelourgou kai autokeleustou gnwmes") the translation "a voluntary and self-impelling will," the implication being that this will is not rigidly bound by causality but is freely informed by reason. And I am now out of time for today. I have not forgotten that I owe several people a follow-up post on divine sovereignty and human freedom, and I have been thinking about a response to the critiques. This passage is found in the work On the Unchangableness of God, from The Works of Philo Judaeus, the Contemporary of Josephus (London, H. G. Bohn, 1854-1890) and was translated from the Greek by Charles Duke Yonge. I searched for an online copy of the original Greek text but found only a defective one Google Books here, which begins on page 75 but is missing pages 76 and 77, so the copy is not very helpful. This is unfortunate, for I'd like to know the Greek for what Yonge has translated as "a voluntary and self-impelling intellect," for this sounds rather like what contemporary philosophers call "libertarian free will" in its emphasis upon the "self-impelling" of our intellect. Another translation -- appearing in Giovanni Reale's Schools of the Imperial Age (edited and translated by John R. Catan) -- offers "a spontaneous and self-determined will," which is similar in meaning but differing in terms. 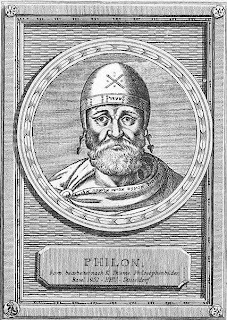 Philo, of course, is drawing on Stoic and Platonic thought, but he attempts to ground his theology in scripture, specifically Deuteronomy 30:15, which states: "Behold, I have put before thy face life and death; good and evil. Do thou choose life." Quod Deus immutab. § 10, i. 280 = .50, quoting Deut. 30.15: παρὸ καὶ λόγιόν ἐστι τοιοῦτον ἀναγεγραμμένον ἐν Δευτερονομίῳ· „ἰδοὺ δέδωκα πρὸ προσώπου σου τὴν ζωὴν καὶ τὸν θάνατον, τὸ ἀγαθὸν καὶ τὸ κακόν, ἔκλεξαι τὴν ζωήν‟ (Deut. 30.15,19). And this is the meaning of the oracle recorded in Deuteronomy, "Behold, I have put before thy face life and death; good and evil. Do thou choose life" (Yonge). This comes from a website presenting the notes that Herbert Edward Ryle wrote for an edition of Philo (1895). Enough for now, for the day calls me to my works of days and ways. I had thought that I was finished with my investigations into bone-rattling, but here I go again. I could blame one of my commenters, Cynthia, but I was already digging deeper before her two comments posted. The first reference I found to it was in a book on Death Customs in England, which referred to it as a trad nursery rhyme and had it in the form I listed in the book. A pauper funeral was something to be avoided, not only because of its extreme simplicity but also for its significance in exhibiting one's failure to maintain a position, however lowly, in society. The covered hand-cart pushed along by a hunched-up attendant with the undertaker striding out in front and the mourners hurrying along behind, made a pathetic accompaniment to the children's rhyme, "Rattle his bones over the stones; he's only a pauper who nobody owns" (from J. Litten, The English Way of Death). Litten's version is similar to Gaiman's in using "who" rather than "whom" but differs in using "he's" rather than "it's" . . . so I can't be sure that Gaiman meant The English Way of Death when he referred to Death Customs in England, though I'm sorely tempted to think so. When we were copyediting, we wondered about the grammer on who and whom and that. Note that Mr. Ward refers to these lines as a "Nineteenth-century English children's ryhme," which gets us rather close to Gaiman's attribution of the lines as a "Traditional Nursery Rhyme." Mr. May then identifies this as "the refrain of a widely sung song, 'The Pauper's Drive', set to music 1839." I noted that this was odd, for the poem was published in 1841 by Thomas Noel in his book of poetry Rymes and Roundelayes. However, I found a second reference to an 1839 date. The appropriately named Julie-Marie Strange -- appropriate for my strange inquiry -- gives this date of 1839 for Noel's poem on page 1 of her book Death, Grief and Poverty in Britain, 1870-1914 (Cambridge University Press, 2005). She seems a little uncertain, however, for she notes "c. 1839" (i.e., "circa"), but she cites page 56 of Burial Reform and Funeral Costs (London: Oxford University Press, 1938), by A. Wilson and H. Levy as her source. This poem was printed in several papers, and only one used italics. The others did not use quotation marks or italics. "Potter's Field of Kings County--A Flagrant Outrage"
I also found a Buz Sawyer comic in the newspapers from 1953, that uses "Rattle his bones over the stones." No references to nursery rhymes. Thomas Noel was born at Kirkby-Mallory on May 11, 1799. 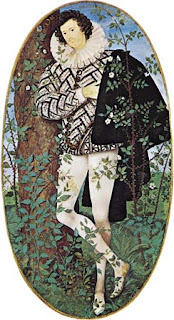 He graduated from Merton College, Oxford, in 1824, and issued in 1833 a series of stanzas upon proverbs and scriptural texts, entitled "The Cottage Muse," [I think it is Muse] and in 1841, "Village Verse" and "Rhymes and Roundelays." 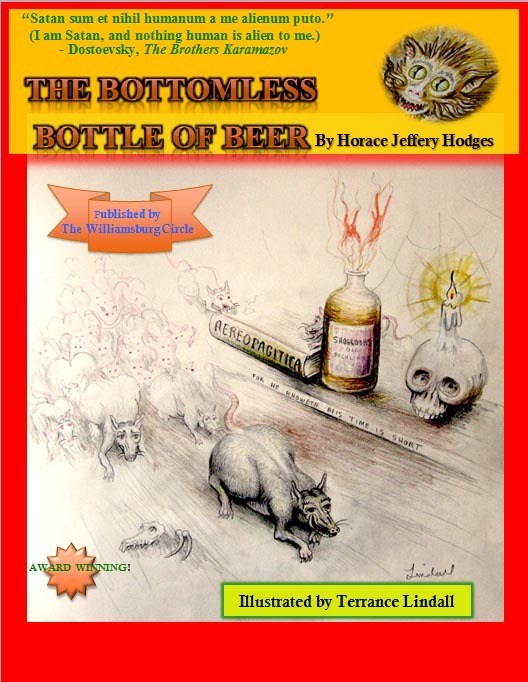 The latter volume included a version of the "Rat-Tower Legend," and "Poor Voter's Song" and "The Pauper's Drive," often wrongly attributed to Thomas Hood. 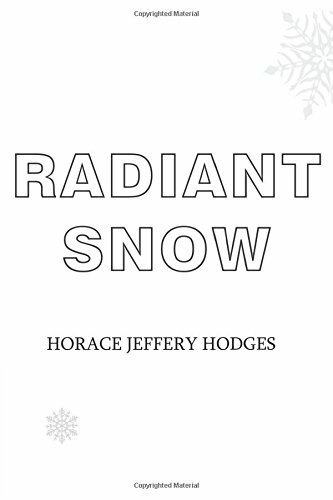 This poem is justly praised by Miss Mitford in her "Recollections of a Literary Life," and was set to music in 1839 by Henry Russell [but see below in my comments - HJH]. Noel also wrote the words of the familiar song, "Rocked in the Cradle of the Deep." Mary Russell Mitford published that book in 1852. You might already know that, but I didn't know who she was,and am not familiar with the book. The Henry Russell song seems to be dated 1846 by another source online. Here is a link to another explanation about the song/poem, in case you didn't see it. He is but a pauper whom nobody owns"
But the misattribution might even go back to 1846, as Cynthia has implied, for the link provided above by Cynthia states that "Henry Russell popularized the words by setting them to music, attributing them to Hood, and singing the piece when on tour," which "no doubt gave rise to the mis-apprehension as to the name of the author." Added to this is the information at this website on "The Music of Henry Russell (1812-1900)" that Russell set the words to music in 1846 (and surely not 1839, despite other sources), thus pushing the date of misattribution back almost to the time of the poem's publication in 1841! Perhaps the similarity of themes and names of the two poets Thomas Hood and Thomas Noel resulted in this confusion. Thomas Noel (1799-1861) was well known in his day, but he should not be confused with his father Thomas Noel (1774-1853), the Leicestershire clergyman . . . though I think that I previously did confuse the two. I found a reference to Noel's father, the clergyman, on page 250 of Peter Quennell's Byron: The Years of Fame: The Years of Fame (2006) informing me that Reverend Noel presided as clergyman at the ceremony in which Lord Byron wed Annabella Milbanke -- and also that Mr. Noel was an illegitimate son of the aptly titled Lord Wentworth, whose name (i.e., "Thomas Noel") he was given. Incidentally, the poet Thomas Noel -- who would be the grandson of Lord Wentworth -- was a friend to Lord Byrons' wife, Annabella Milbanke (Anne Isabella Byron), or at least Wikipedia says so. And perhaps, finally, I have taken this far enough. Gaiman cites it as a "Traditional Nursery Rhyme," but I've found nothing yet to substantiate that. James Joyce et al. : "Rattle his bones"
I found no nursery rhyme, however. Don't bother to reply unless this strikes your fancy. I understand that people are pressed for time. Anyway, I'm enjoying your stories, which I've only recently learned about -- and through a review of the movie Coraline in Christianity Today, of all places. Now, I'm reading everything that you've written. Well . . . everything published that I can find. Thank you, Mr. Gaiman, for taking the time to provide this helpful explanation. Mr. May identifies this as "the refrain of a widely sung song, 'The Pauper's Drive', set to music 1839" (oddly enough, for the poem was published in 1841 by Thomas Noel in his book of poetry Rymes and Roundelayes). Ms. Richardson cites Thomas Noel's poem and notes that it "has the well-known refrain" that I've just quoted, helpfully adding that "'owns' is another word for 'claims' in this context." This couplet is attributed by Answers.com to Thomas Noel, citing "The Pauper's Drive," but note that the writer has also referred to the lines as a "children's rhyme," which returns us to a point close to Gaiman's original identification of the lines as a "Traditional Nursery Rhyme." Perhaps this is as far as we can go, but since we now have Mr. Neil Gaiman's own words on the subject, we need not go further anyway. PS: Since the time this post was written, I've published my own dark fantasy story, partly inspired by Gaiman . 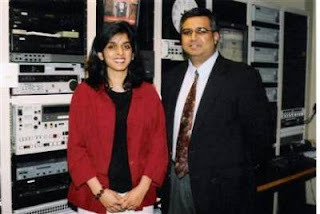 . .
Muzzammil Hassan, founder and CEO of Buffalo, N.Y.-based Bridges TV which [was] launched in 2004 with a mission to show Muslims in a more positive light, was charged after reporting the death of his wife, Aasiya Hassan, 37, on Thursday night. Since the decapitated body of his wife was found at the Bridges TV offices, allegedly beheaded by Mr. Hassan, then if the allegations should prove true (and various reports say that he has confessed), I believe that we can probably conclude that Mr. Hassan has been unsuccessful in his mission. Authorities said Aasiya Hassan, with whom Hassan had two children, had recently filed for divorce and had an order of protection mandating that he leave their home as of February 6. The evidence presented by Chesler thus suggests that Muslim communities have an enormous problem here that goes beyond 'ordinary' domestic violence -- in my opinion, due to the very strict and rigid shame-and-honor control exerted by many Muslim men upon Muslim women. Perhaps if Mr. Hassan had spent more time analyzing this cultural problem rather than simply pursuing his "mission to show Muslims in a more positive light" -- however worthy that may be -- he might have learned to face his own tendencies toward violence and thereby better have succeeded in his 'mission'. Or at least not have failed so spectacularly. He's only a Pauper, whom nobody owns! An intriguing question . . . I have never heard of it as a nursery rhyme. It is a Northern Chartist song, known in my city of Leeds. (I guess its northern/Manchester connection encouraged The Smiths to plagiarise the refrain) It must have been a popular ditty since Joyce uses it in "Ulysses". And that suggests its origin is in music hall rather than nursery rhyme. If it was ever a nursery-rhyme, it would be in Peter Opie's collection, but I do not recall it from that. A puzzle. 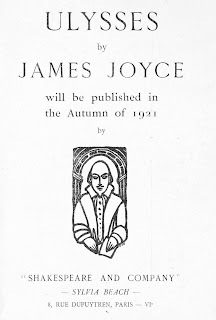 This appears in Ulysses, Part II, "The Odyssey," Episode 6, "Hades," which describes the protagonist, Leopold Bloom, in a funeral carriage on his way to the funeral of Paddy Dignam, who died an undignified death in a drunken stupor, somewhat like Elpenor, a friend of the original Ulysses, Odysseus. --In the midst of life, Martin Cunningham said. --But the worst of all, Mr Power said, is the man who takes his own life. --The greatest disgrace to have in the family, Mr Power added. 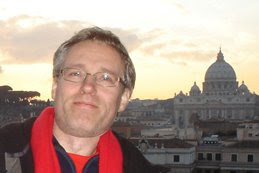 --Temporary insanity, of course, Martin Cunningham said decisively. We must take a charitable view of it. --They say a man who does it is a coward, Mr Dedalus said. --It is not for us to judge, Martin Cunningham said. Zack Bowen discusses these allusions in Musical Allusions in the Works of James Joyce: Early Poetry through Ulysses (1974) but doesn't mention Thomas Noel's poem of 1841. I've not read Bowen's book, and Google Books doesn't provide all of the pages, so I don't know if Bowen explains what song is meant, whether the Chartist mentioned by Eshuneutics or some other. But Don Gifford and Robert J. Seidman, in Ulysses Annotated: Notes for James Joyce's Ulysses (1988), refer readers to Noel's poem, calling it a song but saying nothing of a Chartist song using the lines in question. Earlier even than Bowen, Weldon Thornton wrote in Allusions in Ulysses: An Annotated List (1968) of Noel's poem but also cites this as a song noted by Helen K. Johnson, in Our Familiar Songs (pp. 630-32), who cites Noel for the words but J.J. Hutchinson for the music, but again no reference to a Chartist song. No one seems to be mentioning any nursery rhyme at all. So rattle her bones all over the stones, she's only a beggar-man whom nobody owns. So rattle my bones all over the stones / I’m only a beggar-man whom nobody owns. I have the information on Shelagh Delaney and on The Smiths from "Culture isn't linear," which has some interesting things to say about literary 'borrowings'. It's only a pauper whom nobody owns. It's only a pauper, whom nobody owns. But this is about as far as I can take things . . . for now. Rattle his bones over the stones! He's only a pauper, whom nobody owns! What a jolting and creaking and splashing and din! The whip how it cracks! and the wheels how they spin! How the dirt, right and left, o'er the hedges is hurled! The pauper at length makes a noise in the world! To gentility, now that he's stretched in a coach! He's taking a drive in his carriage at last! Behold what respect to a cloddy is paid! You've a chance to the grave like a gemman to go! And depart from the light without leaving a friend. This poem can be found on page 121 of The World's Best Poetry, Volume 3, Sorrow and Consolation, edited by Bliss Carman and commented upon by Lyman Abbot (J.D. Morris and Company, 1904). According to Wikipedia, the British poet Thomas Noel was born on May 11, 1799 and died on May 22, 1861 and is credited with three volumes of poetry: The Cottage Muse (1833), Village Verse (1841), and Rymes and Roundelayes (1841). He's only a Pauper, whom nobody owns!" What a jolting and creaking, and splashing and din! The whip, how it cracks! and the wheels how they spin! How the dirt, right and left, o'er the hedges is hurl'd! But it will not be long, if he goes on so fast! You've a chance to the grave like a gemman to go. He's only a Pauper, whom nobody owns! " And depart from the light without leaving a friend! Though a Pauper, he's one whom his Maker yet owns! My question -- you knew that one was coming -- is: Did Thomas Noel borrow the refrain from a "Traditional Nursery Rhyme"? Note that he puts that part of his poem in quotation marks . . . though this could easily be explained as being due to the fact that the "sad driver" is singing this "dirge." Be that as it may, does anyone have any information about this "Traditional Nursery Rhyme"? Investigation: Etymology of "Expiation" and "Propitiation"
Etymology doesn't usually get us very far in understanding theological concepts since words pick up a lot of baggage through the centuries along their way to us, but I promised my Bible study class that I'd look up "expiation" and "propitiation" to check their roots. expiation: 1482, from L. expiatus, pp. of expiare "make amends," from ex- "completely" + piare "propitiate, appease," from pius "faithful, loyal, devout." propitiation: 1388, from L.L. propitiationem (nom. propitiatio) "an atonement," from L. propitiare "render favorable," from propitius "favorable, gracious, kind," from pro- "forward" + petere "go to" (see petition). Earliest recorded form of the word is propitiatorium, "the mercy seat, place of atonement" (c.1200), transl. Gk. hilasterion. The verb propitiate is attested from 1645, from L. propitiatus, pp. of propitiare. Propitious "favorable" is from 1447. The Hebrew term kapporeth is identified in the Blue Letter Bible's "Lexicon Results" as "the slab of gold on top of the ark of the covenant which measured 2.5 by 1.5 cubits; on it and part of it were the two golden cherubim facing each other whose outstretched wings came together above and constituted the throne of God." In its function, this is "the golden plate of propitiation on which the High Priest sprinkled the seat 7 times on the Day of Atonement symbolically reconciling Jehovah and His chosen people." There is, however, a lot of disagreement over the definition of this root kaphar and whether it really means "to cover" or "to wipe away" (cf. pdf), but I won't go into that since I know too little and lack the time to investigate properly. I would look briefly at hilasterion in Exodus 25:18, but the Blue Letter Bible hasn't yet finished developing its pages on the Septuagint, i.e., the Greek translation of the Hebrew scriptures. This exercise in etymological investigation hasn't gotten me very far, but I didn't expect it to do so. 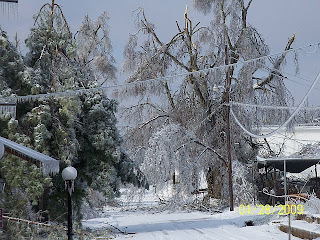 My sister-in-law Sandy Hodges -- married to my youngest full brother, Pastor John -- forwarded these pictures taken by her friend Karen Willett and revealing, in the most stunning detail yet, just how severe the ice was in my hometown of Salem and the surrounding area. The first is obviously just outside of somebody's home, perhaps Ms. Willett's, early in the morning after the storm. The next photograph shows the drive out of someone's front yard, possibly again Ms. Willett's place. Note the broken limb dangling dangerously at the top center. That's surely come down by now -- either by cutting or by the recent windstorm. 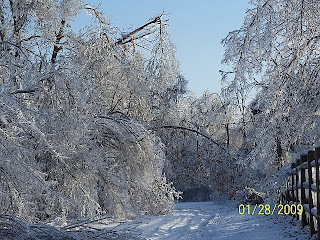 The following photo is similar, again a driveway with trees and their bent limbs, but also revealing the heavy ice pulling on the powerlines. 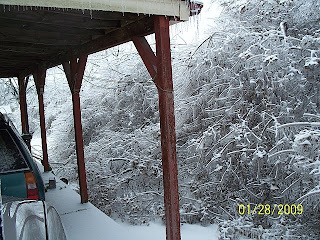 Note those long, sharp icicles! 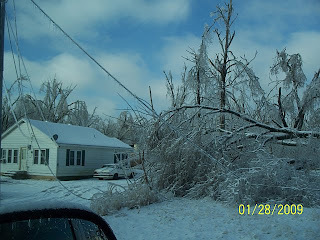 Next, an entire tree seems to have come down, along with several powerlines. 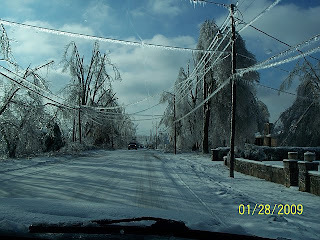 In the following image, taken during a drive, note the many powerlines hanging dangerously low. 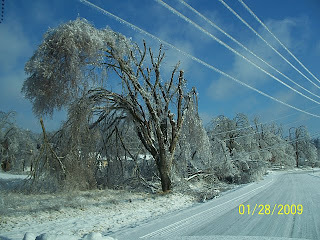 Below, a frozen road, broken tree, icy powerlines, and wispy clouds. 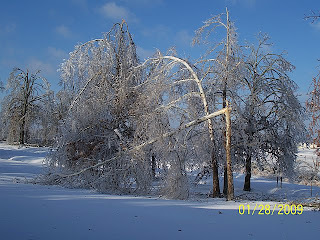 Bowed and broken trees in a penultimate image. 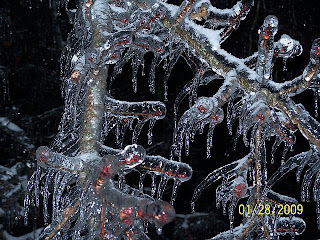 Finally, a close-up for everyone to see what two inches of freezing rain will do to a tree branch . . . and note the dusting of snow that followed the ice storm. If you want to see more images, Ms. Karen Willett has them available on Kodak Gallery, where you can click on the slideshow and see them all.